For the use of !? and ?! in chess notation, see Chess annotation symbols. For the Italian television series, see Interbang. For the Caparezza album, see ?! (album). The interrobang (/ɪnˈtɛrəbæŋ/), also known as the interabang (‽) (often represented by ?! or !? ), is a punctuation mark used in various written languages and intended to combine the functions of the question mark, or interrogative point, and the exclamation mark, or exclamation point, known in the jargon of printers and programmers as a "bang". The glyph is a superimposition of these two marks. A sentence ending with an interrobang asks a question in an excited manner or expresses excitement or disbelief in the form of a question. Writers using informal language may use several alternating question marks and exclamation marks for even more emphasis; however, this is regarded as poor style in formal writing. Historically writers have used multiple punctuation marks to end a sentence expressing surprise and question. American Martin K. Speckter (1915 – February 14, 1988) conceptualized the interrobang in 1962. As the head of an advertising agency, Speckter believed that advertisements would look better if copywriters conveyed surprised rhetorical questions using a single mark. He proposed the concept of a single punctuation mark in an article in the magazine TYPEtalks. Speckter solicited possible names for the new character from readers. Contenders included exclamaquest, QuizDing, rhet, and exclarotive, but he settled on interrobang. He chose the name to reference the punctuation marks that inspired it: interrogatio is Latin for "rhetorical question" or "cross-examination"; bang is printers' slang for the exclamation mark. Graphic treatments for the new mark were also submitted in response to the article. In 1965, Richard Isbell created the Americana typeface for American Type Founders and included the interrobang as one of the characters. In 1968, an interrobang key was available on some Remington typewriters. 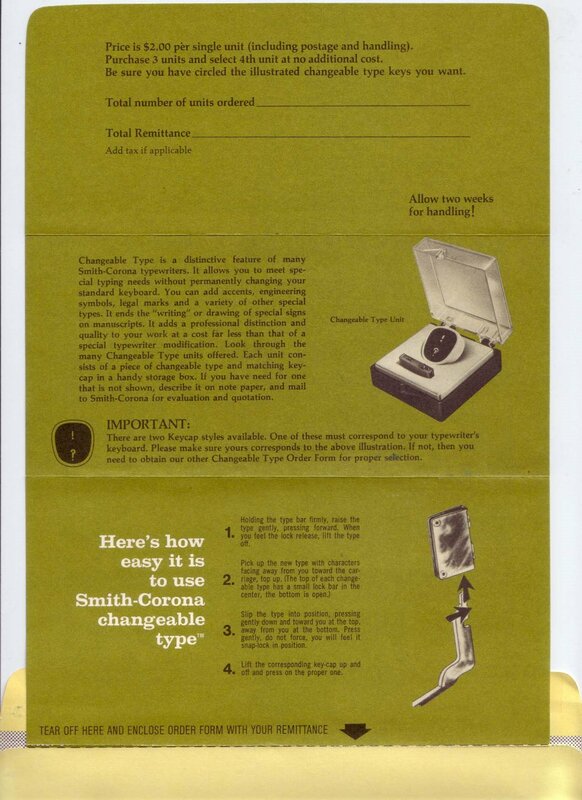 In the 1970s, replacement interrobang keycaps and typefaces were available for some Smith-Corona typewriters. The interrobang was in vogue for much of the 1960s; the word interrobang appeared in some dictionaries, and the mark was used in magazine and newspaper articles. Most fonts do not include the interrobang, but it has not disappeared: Lucida Grande, the default font for many UI elements of legacy versions of Apple's OS X operating system, includes the interrobang, and Microsoft provides several versions of the interrobang in the Wingdings 2 character set (on the right bracket and tilde keys on US keyboard layouts), included with Microsoft Office. It was accepted into Unicode and is included in several fonts, including Lucida Sans Unicode, Arial Unicode MS, and Calibri, the default font in the Office 2007, 2010, and 2013 suites. A reverse and upside down interrobang (combining ¿ and ¡, Unicode character: ⸘), suitable for starting phrases in Spanish, Galician and Asturian, which use inverted question and exclamation marks, is called an "inverted interrobang" or a gnaborretni (interrobang written backwards). In current practice, interrobang-like emphatic ambiguity in Hispanic languages is usually achieved by including both sets of punctuation marks one inside the other (¿¡De verdad!? or ¡¿De verdad?! [Really!?]). Older usage, still official but not widespread, recommended mixing the punctuation marks: ¡Verdad? or ¿Verdad! The interrobang is not a standard punctuation mark. Few modern typefaces or fonts include a glyph for the interrobang character. The standard interrobang is at Unicode code point U+203D ‽ INTERROBANG (HTML &#8253;). The inverted interrobang is at Unicode code point U+2E18 ⸘ INVERTED INTERROBANG. Single-character versions of the double-glyph versions are also available at code points U+2048 ⁈ QUESTION EXCLAMATION MARK and U+2049 ⁉ EXCLAMATION QUESTION MARK. The interrobang can be used in some word processors with the alt code Alt+8253 when working in a font that supports the interrobang, or using an operating system that performs font substitution. Depending on the browser and the fonts installed by the user, some of these may or may not be displayed or may be replaced with a character of a different font. On a Linux system supporting the Compose key, an interrobang can be produced by pressing the compose key followed by the exclamation point and the question mark; reversing the order creates the inverted interrobang. On Mac OS X, it is found on the Character Palette, obtained by pressing the key combination control+⌘ Cmd+Space. The interrobang can be displayed in LaTeX by using the package textcomp and the command \textinterrobang. The inverted interrobang is also provided for in the textcomp package through the command \textinterrobangdown. The State Library of New South Wales, in Australia, uses an interrobang as its logo, as does the educational publishing company Pearson, which intend it to convey "the excitement and fun of learning". Chief Judge Frank H. Easterbrook used an interrobang in the 2012 United States Seventh Circuit opinion Robert F. Booth Trust v. Crowley. Australian Federal Court Justice Michael Wigney used an interrobang in the first paragraph of his 2018 judgment in Faruqi v Latham  FCA 1328 (defamation proceedings between former Federal Opposition Leader, Mark Latham, and political campaigner and writer, Osman Faruqi). There is an Italian thriller movie titled Interrabang (Italian for interrobang), which was released on December 31, 1969. ^ "interabang". The American Heritage Dictionary of the English Language (5th ed.). November 1, 2011. Archived from the original on November 14, 2012. Retrieved June 14, 2012. ^ Mandeville, Henry (1851). A Course of Reading for Common Schools and the Lower Classes of Academies. Retrieved November 22, 2013. ^ Gleckler, Arthur. "The Jargon File". The Jargon File. Archived from the original on April 26, 2012. Retrieved December 7, 2011. ^ Punctuation Archived April 2, 2015, at the Wayback Machine. Chicago Style Q&A. Chicago Manual of Style Online. (15th ed.) Accessed August 28, 2007. ^ "Martin K. Speckter, 73, Creator of Interrobang". New York Times. February 16, 1988. Archived from the original on March 20, 2016. ^ Spekter, Martin K. (March–April 1962). "Making a New Point, or, How About That …". TYPEtalks. ^ Garfield, Simon (2010). Just My Type: A Book About Fonts. London: Profile. p. 269. ISBN 9781846683015. ^ Burton, Gideon O. interrogatio Archived November 19, 2005, at the Wayback Machine. Silva Rhetoricae: The Forest of Rhetoric. Brigham Young University. Accessed August 28, 2007. ^ a b Haley, Allan. "The Interrobang Is Back". fonthaus.com. June 2001. Archived from the original on May 7, 2008. Retrieved December 3, 2010. ^ Houston, Keith (2013). Shady Characters: The Secret Life of Punctuation, Symbols, & Other Typographical Marks. New York: W. W. Norton. p. 29. ^ Smith-Corona flyer illustrating the Changeable Type system with an exclamation mark / interrobang unit Archived March 26, 2009, at the Wayback Machine Accessed March 7, 2009. ^ The Interrobang: A Twentieth Century Punctuation Mark. Archived October 13, 2004, at the Wayback Machine Accessed August 28, 2007. ^ "Unicode Code Charts, General Punctuation, 2000–206F" (PDF). Archived (PDF) from the original on August 4, 2011. Retrieved March 3, 2011. ^ MSDN fontblog Archived March 7, 2010, at the Wayback Machine. Accessed August 28, 2007. ^ "Unicode Code Charts, Supplemental Punctuation, 2E00–2E7F" (PDF). Archived (PDF) from the original on August 12, 2011. Retrieved March 3, 2011. ^ "Library Executive". sl.nsw.gov.au. State Library of New South Wales. Archived from the original on February 1, 2016. Retrieved July 13, 2017. ^ "Pearson Brand Guidelines: Logo" (PDF). Pearson.com. 2016. Archived (PDF) from the original on March 12, 2016. Retrieved July 13, 2017. ^ Roman Mars (July 10, 2018). "Interrobang". 99% Invisible (Podcast). Radiotopia. Archived from the original on July 30, 2018. Retrieved July 29, 2018. ^ Easterbrook, Frank H (June 13, 2012). "Robert F. Booth Trust v. Crowley" (PDF). p. 8. Archived (PDF) from the original on July 18, 2018. Retrieved July 18, 2018. We don't get it. In order to avoid a risk of antitrust litigation, the company should be put through the litigation wringer (this suit) with certainty‽ How can replacing a 1% or even a 20% chance of a bad thing with a 100% chance of the same bad thing make investors better off? ^ "IMDB entry for Interrabang movie". www.imdb.com. IMDB. Archived from the original on February 11, 2017. Retrieved June 7, 2018. Look up ‽, !?, ? !, or interrobang in Wiktionary, the free dictionary.